CAIRO, Jul 5 2013 (IPS) - In less than three days, Egypt moved from being under the rule of religious Islamists to being in different civilian hands as well as military ones. Mohamed Morsi, Egypt’s first democratically elected president, was overthrown by the army on Wednesday after massive nationwide protests calling for his removal on the first anniversary of his election to power. The powerful military issued a 48-hour deadline on Monday for Morsi to meet the “people’s demands”, a day after millions of protesters took to the streets across the troubled country calling for him to resign. The position of the United States towards its allies in Egypt (the Muslim Brotherhood) was critical. U.S. President Barack Obama declared that Washington would review the implications for U.S. foreign assistance programmes to Egypt, as an estimated 20 percent of Egypt’s military budget is provided by the United States. 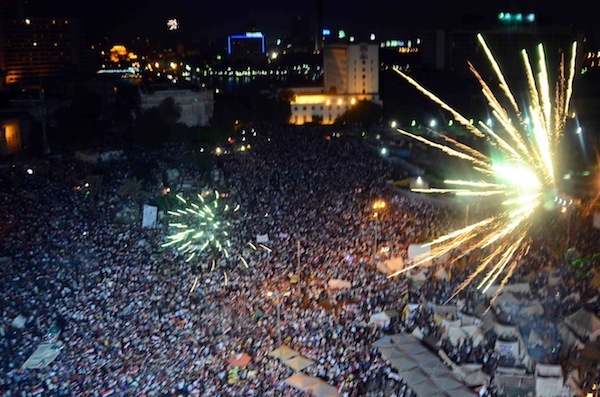 Obama stopped short of calling the events a coup, however, while Egyptians see the change as a public movement that completes the revolution of Jan. 25, 2011, which was supported by the army. Less than 15 hours after the minister of defence, Field Marshal Abdel Fatah al-Sisi, declared the road map for the transitional period, he announced that Egypt’s constitution had been suspended and gave power to the head of the Supreme Court, Adly Mansour, naming him interim president of the republic for six months, according to the 1971 constitution. Several changes occurred in different sectors after Morsi’s fall. The stock exchange rose 7.5 percent, progress unseen since 2010. Financial shares did not decrease until the end of the day – also an unprecedented achievement in the history of the Egyptian stock exchange. Mohsen Adel, an economic analyst, told IPS he was expecting a continuous rise in banking sector indicators as well. On a regional scale, the events of Jul. 3 helped Egypt to maintain its leading role in the Arab world and renew relations with a number of Arab countries. Qatar, the strongest supporter of former president Morsi, announced on Al Jazeera television that it would support Egypt in its role as the leader of the Arab and Islamic world. The new emir of Qatar, Tamim ben Hamad, sent his congratulations to the new president and the Egyptian people. Both Saudi Arabia and the United Arab Emirates announced they would supply Egypt with funding and oil as the situation progresses. Relations between Egypt and the United Arab Emirates were tense after the UAE arrested a terrorist cell that included elements belonging to the Muslim Brotherhood. The UAE government refused to release them, leading Muslim Brotherhood leaders to attack and insult UAE rulers. “The map of Egyptian relations with many neighbouring countries will witness a huge change in the near future,” Emad Gad, the director of al-Ahram Institute for Strategic and Political Studies, told IPS. Gad asserted that relations with the United States might be tense in the current situation because of the country’s support for Morsi and the Brotherhood. Strategic relations between the two countries are deeply rooted, and if the United States continues pressuring Egypt by threatening to reduce or halt military aid, Egypt’s relations with Russia and China could shift as a result. Such a change would be a major danger for the United States because Egypt’s source of military arms would shift to Russia, which would threaten both U.S. control over the Egyptian army and U.S. national security. Egypt’s tensions with Syria will calm down, and Egypt may not make any hostile decisions against the regime of Bashar Al-Assad regime, Gad continued, though the new government would not be involved in supporting the current regime for fear it would undermine the Syrian people or induce the disapproval of the international community. “Egypt and Russia will witness a new stage of successful cooperation in the near future, and I think there could be cooperation on different levels between the two countries,” Gad said, due to Russia’s support for the Egyptian revolution since the events of Jun. 30. “From the beginning of the deep changes in the Middle East we have declared support for lawful aspirations of the Egyptian people for a better life with freedom and democratic renewal. Russia’s position remains invariable and principled,” the Russian foreign ministry said in a statement on Thursday. Egyptians saw the rapid arrest of the leaders of the Muslim Brotherhood not as a military coup but as precautionary steps to prevent the Brotherhood from directing their angry supporters in the streets towards bloody violence, especially since the country had witnessed acts of sabotage leading to dozens of deaths and hundreds of injuries before the ouster of the former president. In his last speech, Morsi tried to perform as a self-confident legal president, alluding that any move against him would be a coup against legitimacy. Badie believed that the fall of the Muslim Brotherhood was natural given its accumulated mistakes and refusal to listen to suggestions given to them by his party. The failure of the experience of the Muslim Brotherhood does not mean that other Islamist political parties would abandon the target of establishing an Islamic state but demonstrates how difficult such an achievement would be. The roadmap currently being drawn by Islamist parties will be to ensure the safety of the members of the different parties. This will be trying to ensure that the police will not return to their previous violence or strict practises against Islamists, such as forcing them to shave their beards, Badie said. He expressed fear that the new regime would forbid Islamists from creating political parties and thus hinder their Islamist project, noting that the arrest of several leaders of the Muslim Brotherhood was evident in trying to give the military coup a public cover.